Panasonic has officially released a portable Blu-ray Disc player to the consumer market. 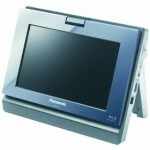 The DMP-BD15 is built with an 8.9-inch WSVGA LCD display and features Viera Cast functionality for connecting to internet sites. This will allow you to view YouTube, Google Picasa, Bloomberg and a weather channel free-of-charge on your HDTV. Using the same technology as Panasonic players like the DMP-BD80, the DMP-B15 ensures high pixel quality using PHL Reference Chroma Processor Plus technology. This technology processes each pixel of the Blu-ray Disc video signal, reproducing color data with what Panasonic says is twice the accuracy of conventional systems. Late in June, the B15 will also be compatible with Amazon streaming movie downloads (a library of 40,000 titles). The player also features BD-Live and a rechargeable battery rated at 2.5 hours run time. You can connect the Blu-ray player to an HDTV via HDMI, or use as a standalone player. Audio can be connected to an HD-Audio compatible AV receiver. An optional headrest mounting bracket can be used in your car. And, like many portable players the DMP-BD15 includes an SD memory card slot for viewing photos and videos. The Panasonic DMP-BD15 Blu-ray Player retails for $799 and is available at most electronics retailers including Amazon.com. this looks awesome but I cant pay that much. if they were closer to the price of a portable DVD player I would consider. Maybe even double the cost.